When it comes to choose a liquid cooling system (LCS), users are often astonished by its performance and overwhelmed by the complex setup. Thermaltake, being the industry pioneer brand with expertise in PC thermal solutions, is thrilled to introduce the all new LCS – the Water 2.0 Series. Featuring the all-in-one LCS solutions for users with different enthusiasms, it includes the Water 2.0 Extreme, the Water 2.0 Pro and the Water 2.0 Performer. The new Water 2.0 Series made setting up just as easy as it cools. 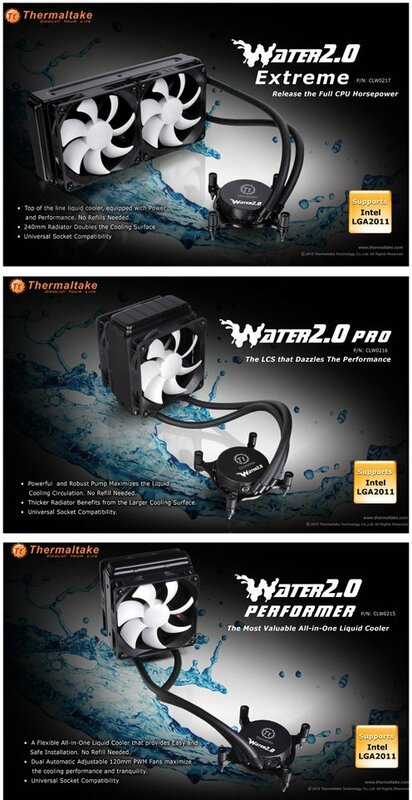 More details about the Water 2.0 series can be found at ThermalTake.